Stephanie Parks Warshaw, M.A., et al. Eng, 2006. Span, 2012. 8.5x11, 3-ring tabbed binder, 560 pages. 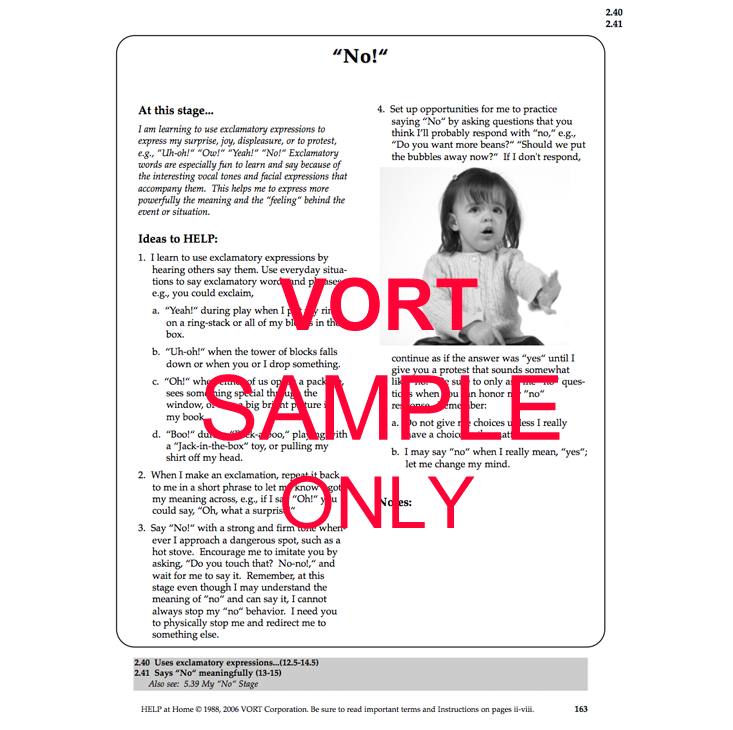 Relationship and routines-based reproducible hand-outs for families. Links directly as the curriculum component to HELP 0-3 skills (assessments). Available in English and Spanish. Thousands of activities for parents to support, encourage, and facilitate their child’s growth and development. 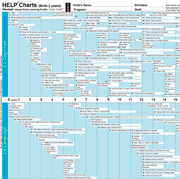 Each page (handout) provides "At this Stage..." and "Ideas that HELP" sections. 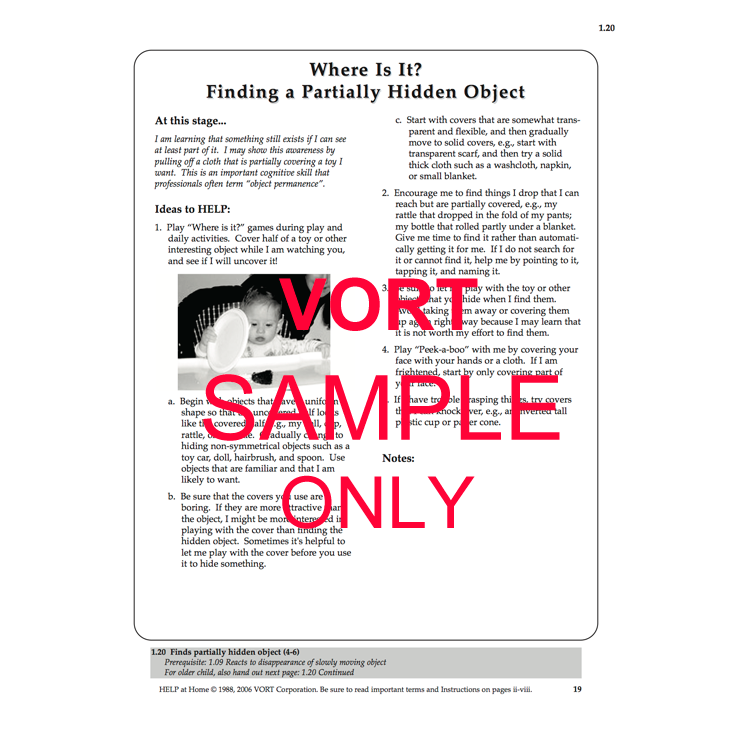 Formatted for easy copying of just the activities, but with direct reference to the HELP 0-3 skill. Anticipatory guidance to help families read and respond to infant cues; understand and deal with sibling rivalry, tantrums, and separation anxiety, explaining disabilities; learn about safety, dental care, and feeding problems. 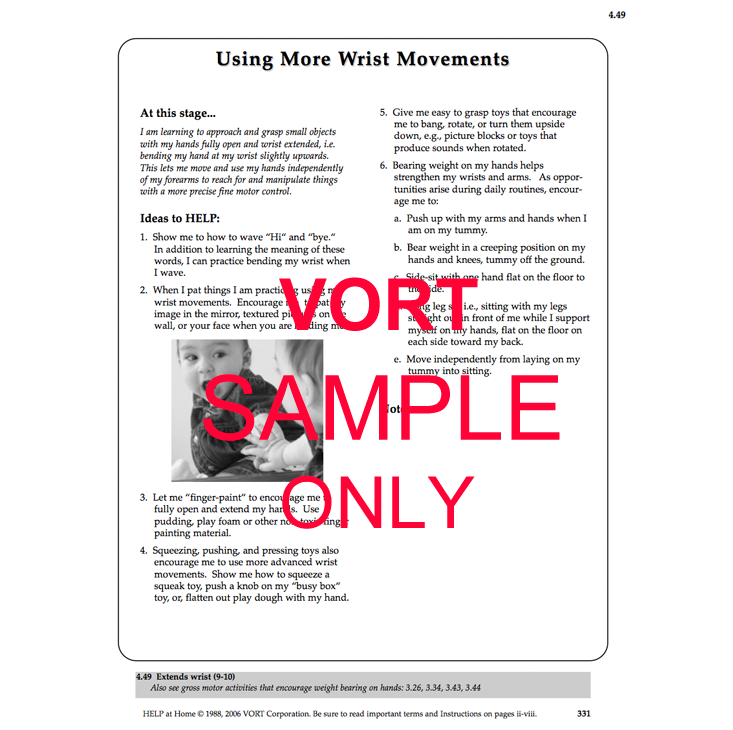 Step-by-step instructions for body positioning and special handling techniques including jaw support, holding, feeding and play. Comprehensive glossary and Appendices for reading cues, positioning, consoling techniques, safety. Provides space to write individualized additional activities or notes. 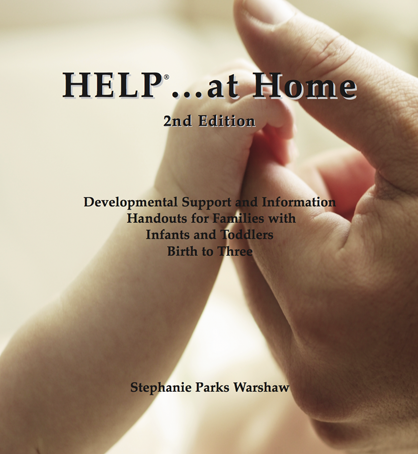 Comprehensive: Includes handouts for parents with children who are developing typically, have delays, or are considered at-risk. 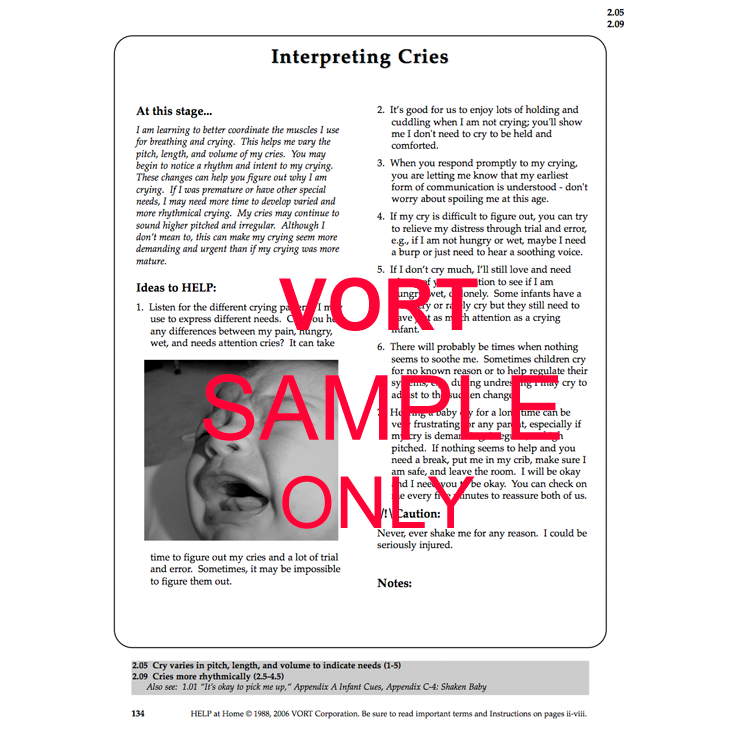 Saves time: Practical and convenient format covers the 685 HELP assessment skills/behaviors with each page formatted as a separate, reproducible activity sheet you annotate, copy and hand out directly to parents to facilitate their involvement. 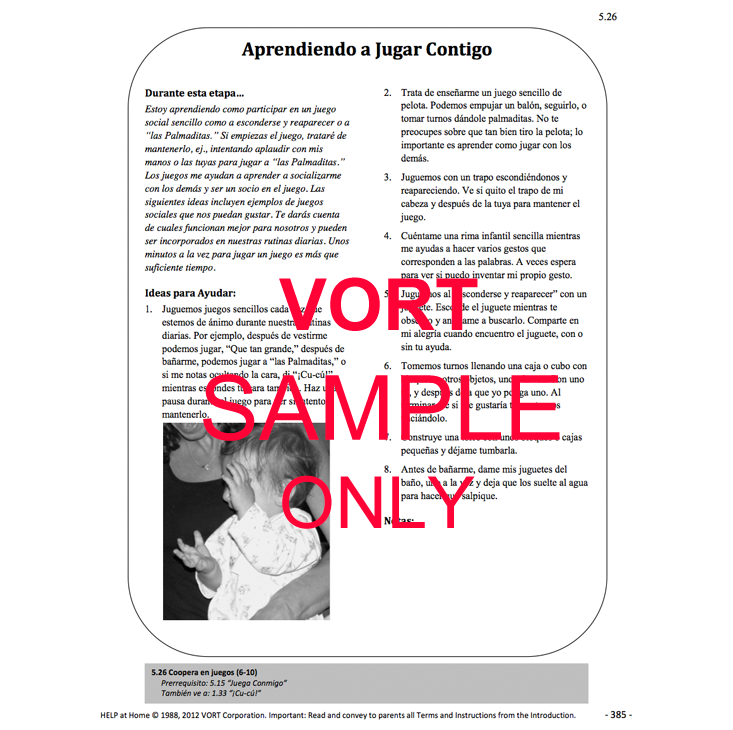 Interdisciplinary and comprehensive: Handouts for professionals to give parents of children (developmentally) birth to three years, including disabled, delayed and at-risk children -- with thousands of activities for the six developmental domains: Cognitive, Language, Gross Motor, Fine Motor, Social-Emotional, and Self Help. Written from the child's point of view: Parents definitely prefer this unique approach. They find the activities easier to relate to, more enjoyable, and very helpful in becoming more sensitive to their child's perspective and needs. Written in warm, simple and non-technical language. Easily individualized: With space for you to write in specific suggestions for parents to help them understand and fully participate in their child's development. "Invaluable to an early intervention team."